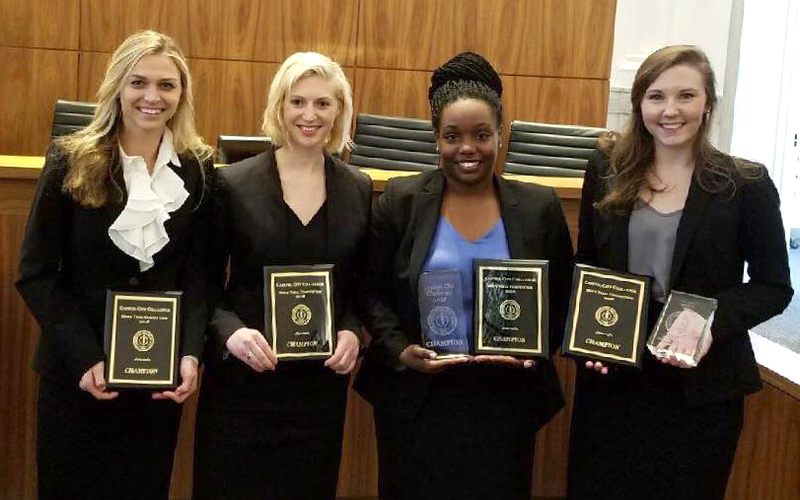 WASHINGTON, D.C. – Campbell Law student advocates stole the show during the school’s first ever appearance at the Capitol City Challenge National Invitational Mock Trial Competition this past weekend, bringing home a national title and the award for best advocate in the finals. The team was comprised of Latasia Fields, Meredith Kittrell, Alexandra Puszcynski and Dale Stephenson. Kittrell brought home best advocate in the final round, while Fields and Kittrell served as lawyers throughout the entire stay. The group marks the first all-female group of student advocates to win a national title at Campbell Law. The team was coached by assistant professor Anthony Ghiotto and 2016 graduate and former Wallace Fellow Brittany Stiltner. Campbell Law’s student advocates breezed through the opening rounds prior to knocking off the University of Denver School of Law in the semifinals. They then topped Stetson School of Law in the finals to bring the hardware back to Raleigh. The competition was hosted by American University Washington College of Law. Campbell Law’s historically strong competitive advocacy program has particularly blossomed in recent years. Since 2012 Campbell Law student advocates have collected five national championships, six national runners up, seven national semifinalists, four regional championships and 14 national individual best advocate awards. A month ago, preLaw magazine highlighted Campbell Law’s trial advocacy program as one of the best in America for the second year in a row. The program is currently ranked inside the top 10 nationally by Fordham University School of Law’s Trial Competition Performance Rankings. Last April, U.S. News & World Report had high praise for Campbell Law’s advocacy program, tapping it as tied for 21st-best in the country.